BélaFleck and Abigail Washburn concert tickets are $45 and $50 and can be purchased by calling St. Cecilia Music Center at 616-459-2224 or visiting the box office at 24 Ransom Ave. NE. Tickets can also be purchased online at www.scmc-online.org. A post-concert party with complimentary wine and beer bar is offered to all ticket-holders. All ticket prices include service fees and no additional fees are charged. 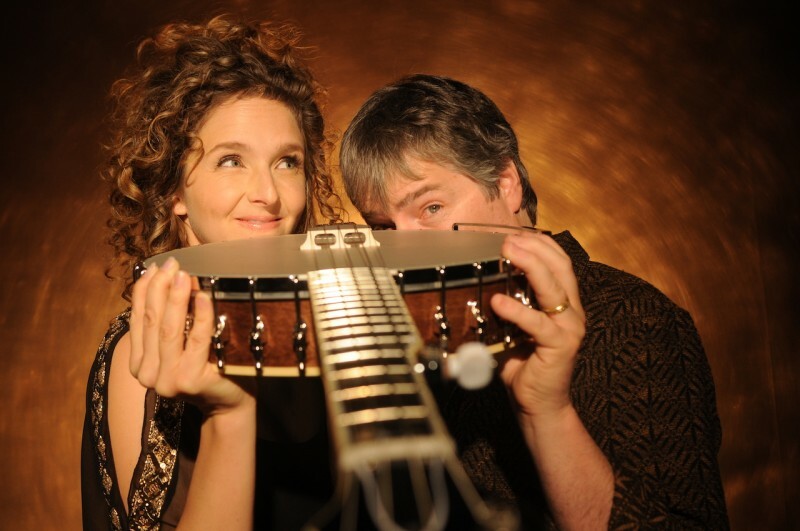 Béla Fleck and Abigail Washburn concert tickets are $45 and $50 and can be purchased by calling St. Cecilia Music Center at 616-459-2224 or visiting the box office at 24 Ransom Ave. NE. Tickets can also be purchased online at www.scmc-online.org. A post-concert party with complimentary wine and beer bar is offered to all ticket-holders. All ticket prices include service fees and no additional fees are charged. In fall 2017, Béla Fleck and Abigail Washburn released their second full-length studio album together: Echo In The Valley. The 11-track LP includes the two master banjo players playing amazing folk and bluegrass music. More recently, in October 2018, the husband-wife duo released a new single that marries two songs from their second album, which also is the soundtrack for a new music video featuring them with renowned dance company, Pilobolus. The new single and video pairs “Come All You Coal Miners”, written by Appalachian ballad singer, activist and wife of a coal miner, Sarah Ogan Gunning, followed by the duo’s own “Take Me to Harlan.” To celebrate their new release, Fleck and Washburn returned to the road this past fall and are traveling the country together through spring 2019. Béla Fleck & Abigail Washburn will return to SCMC on Saturday, February 9, 2019. “The king and queen of the banjo”first appeared together on stage at SCMC this past February 2018. With a strong fan base in Grand Rapids, SCMC is delighted to bring the two of them back for an encore performance. Béla Fleck is a fifteen-time Grammy Award winner who has taken the instrument across multiple genres, and Abigail Washburn is a singer-songwriter and clawhammer banjo player who re-radicalized it by combining it with Far East culture and sounds. The War and Treaty will perform on Sunday, February 24, 2019. Chilling, soulful, and powerful are just some of the words used by audiences to describe The War and Treaty. The husband & wife duo blend roots, folk, gospel, and soul, reaching back through their deep-rooted history to conjure up the strength of their ancestors. They are currently on tour, hoping to share songs of reconciliation and humanity, and taking listeners on a soaring, emotional ride. The Milk Carton Kids will perform at SCMC on Thursday, February 28, 2019. Nominated in 2015 for a Grammy for Best American Roots Performance, Best Folk Album of the year in 2013, and winner of The Americana Music Association for Best Duo/Group of the year in 2014, The Milk Carton Kids released a new album on June 29, 2018 from ANTI-Records entitled “All the Things That I Did and All the Things That I Didn't Do.This is the first full-band tour they have ever done. Asleep at the Wheel will return to SCMC on Thursday, April 11, 2019. Over their history, Asleep at The Wheel has earned ten GRAMMY Awards and released more than 25 studio and live albums, and there is no sign of them slowing down any time soon. The band’s release, Still the King: Celebrating the Music of Bob Wills and His Texas Playboys, garnered the 2016 GRAMMY Award for Best Recording Package.New Routes, their brand-new album released in September 2018, marks both a new path forward and a nod to their freewheeling roots as one of Texas’ most beloved bands. Guitarist Leo Kottke will return to SCMC on Thursday, April 18, 2019. Over his many years of writing and performing, Kottke has composed scores for film soundtracks, children’s shows, and a symphony, as well as released many albums. Focusing primarily on instrumental composition and playing, Kottke also sings sporadically, in an unconventional yet expressive baritone. In concert, Kottke intersperses humorous monologues with vocal and instrumental selections played solo on his 6- and 12-string guitars. Ticket prices: All ticket prices include service fees and are the same no matter the purchase point. No additional fees will be added. All concerts start at 7:30pm. All concerts include a post-concert party for concert ticket holders.